Ahi tuna is one of the most common varieties of fish that you can find in the Seattle area local markets. Ahi is a Hawaiian adjective to name the yellowfin tuna (Thunnus albacares) found in pelagic waters of tropical and subtropical oceans worldwide. Yellowfin tuna is widely used in raw fish dishes, especially sashimi, and is often served seared rare. This fish is also excellent for grilling too and is is becoming a popular replacement for the severely depleted supplies of southern bluefin tuna. Bonito del Norte is a kind of albacore tuna, Thunnus alalunga, also called white tuna that is caught in the Cantabrian Sea, in the North Shore of Spain. This fish live through the winter in the waters around the Azores and they move in late spring to the Cantabrian Sea. It is during these migrations when the campaign starts and it ends around September. It involves ships from Galicia, Asturias, Cantabria, the Basque Country and France. Bonito del Norte is one of our most traditional and appreciated fish, great for preparing traditional recipes and to be canned too. One of this recipes is Marmitako, prepared in the Basque country, a top cookin g region in Spain. Marmitako is a really popular dish in Spain, because being an oily fish, It is highly valued in the recent nutrition trends. This recipe is usually one of the top plates of culinary competitions of any Cantabrian and Basque festival, especially in coastal locations. As I´ve received green split peas in my delivery from PNW Co-op Specialty foods, I thought an ahi tuna marmitako, Pacific NW version, would be a good recipe to start to play with this delicious staples. Dry sweet peas are difficult to find in Spain, we usually buy them frozen or canned. It was the first time I was dealing with them so I decided to treat them as any other legume soaking them in water the previous day. Surprisingly these sweet peas are so tender that after cooking for half an hour I realized that they´ve been overcooked. Damn it! So I needed to go through plan B and I decided to keep them for a veggie soup… But this is another story and other recipe. 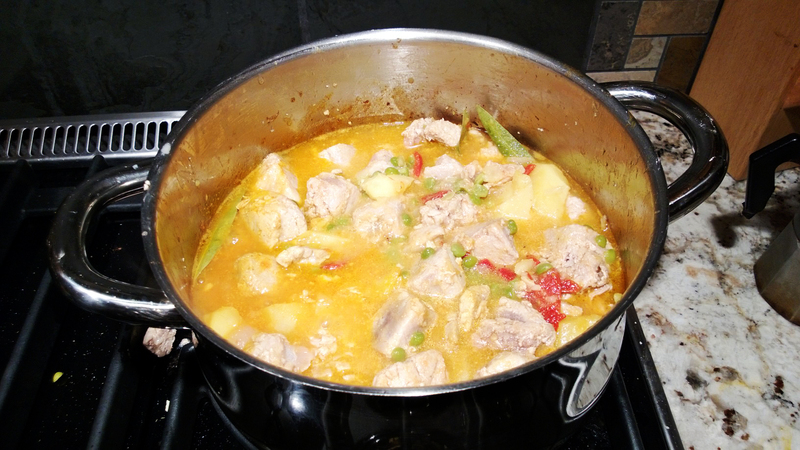 So I finally I added a new supply to the tuna stew with no previous soaking and cooking. I usually write about easy, quick healthy recipes in the blog. Marmitako is not complicated but It requires longer time than other of my meal suggestions. Anyway is a perfect entertainment for a rainy cold Sunday evening, and believe me, we have plenty of those here in Seattle duringour long winters. Altough you´re used to see ahi tuna in sashimi and poke most of the time, I encourage you to try this winter Spanish traditional version. Enjoy it! Heat the olive oil in a saucepan. Pan fry the tuna, skinless and boneless, and cut it into 1 inch cubes. 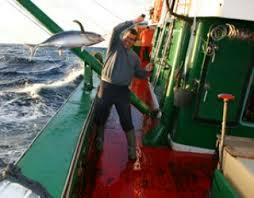 Once the tuna is rare cooked remove and reserve it. Add finely chopped onion and stir with a wooden spoon until It has golden colour, about 6 minutes over low heat. Add Peeled and crushed tomatoes and stir them. Add the potatoes cut into thick slices and the green split peas and cover everything in water. Add salt moderately. Crush the garlic in the mortar with some salt and parsley. Dissolve a couple of tablespoons of the broth in the mix. Add it to the stew with the bay leaf and the chilli. Cook over low heat for about 30 minutes. Then add the ahi tuna, the seasoning mix and the piquillo peppers. Boil everything 10 minutes and serve it in the same pan. I recommend to pair it with white wine. If you want to go local try any Riesling as Chateau Saint Michelle. And If you want to go global, Spain DO Albariño or DO Rueda Verdejo wines will be a perfect fit for the tuna. Cheers!